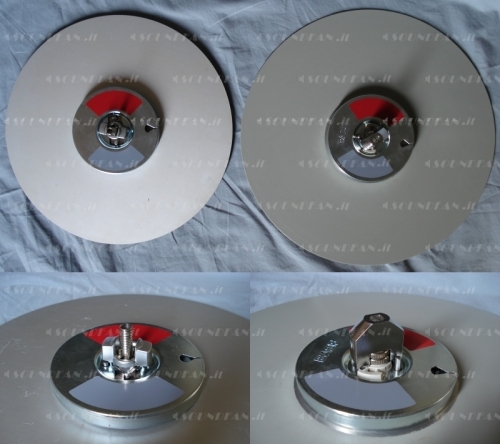 Reels are wound on plastic or aluminium flange which diameter ranges from 3.1/4 to 10.1/2” for different playing time. Table below shows recording time referred to different speeds for standard and long, or extended, play tapes (one side only). You can use the table to covert the units of measure between the metric system and the Anglo-Saxon system and vice versa too. Double (and triple too) play tapes with reduced thickness were available at the same reel diameter. They were more fragile and deformable than standard and long playing tapes and were not used in professional field. In AEG DIN support, available for studio and professional use only, tape is wound without a flange on a self support metallic core (the so called “bobby”) and locked on an open plate ("pancake") not compatible with Cine or Nab locking system (but easily interchangeable with them changing the upper part of the recorder reel supports in few minutes). Is interesting to know German sound engineers, to reduce the print trough effect and have the recorded tape ready to play, wound the tape on the metallic core with the magnetic coated side facing the outside not the inside as international standard. This is why the Telefunken Magnetophon M series are available in two different versions one for the international market (“A wind” version) and another one for Deutsch market (“B wind” version) with the head block turned down or up respectively. Professional studio recorders can use larger (14") pancake plates for very high speed (30 ips) recording or longer recording time at standard speed. (see photo below). In few words there are two kinds of tape: obsolete acetate tape and new polyester ones. They can simply recognize acetate tapes from polyester ones watching the reel in backlight: the acetate tape will look transparent. 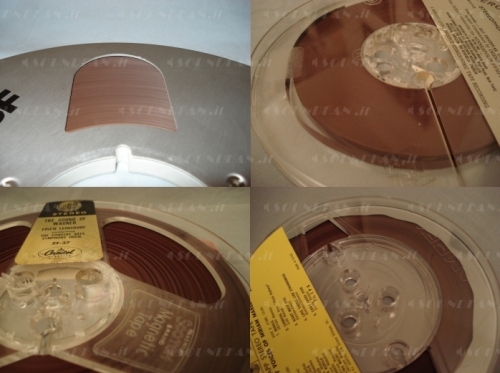 Older polyester tapes had shiny reverse side and matt magnetic coated surface; newer ones (starting from 1970 about till today) had black matt reverse side and magnetic coated shiny surface. In every kind of tapes the magnetic coated side has to face the heads. Knowing the right kind of tape you are working on is very important in restoration to avoid damages due to wrong procedure. Different kind of tapes have different physical and chemistries characteristics and have to be treated in different ways. Over the years different kinds of metal oxide were tested and used to improve tape quality reducing the signal noise ratio, print trough, distortion and improve dynamic. Each tape was slightly different from the other and every manufacturer suggested the different BIAS and level settings better fit their tape. Basically speaking the so called BIAS, in magnetic recording field, is an high frequency signal (usually from 100,000 to 150,000 hz about or higher) recorded on the tape at the same time of musical signal. This principle, discovered in 1940 by accident, dramatically improves distortion and high frequencies response giving a very high quality recording. 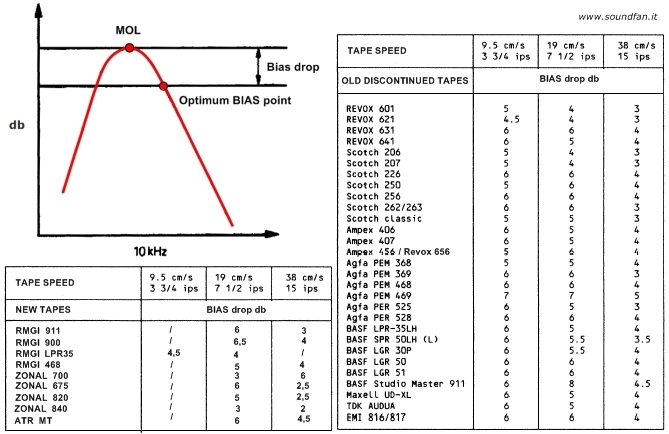 The Bias frequency is even the same but its level has to be adjusted according to different kind of tapes and speed (see table below) for the best MOL (Maximum Output Level) with less THD (Total Harmonic Distortion). This is why the reel to reel recorder has to be aligned according to the kind of tape used for the best recording result. Table shows BIAS recommended setting reffered to Studer rec and play heads. It has to be used as guide only not as absolute reference for all the open reel recorders. Most used tapes cross reference list both for recording and BIAS level. Except Rmgi and ZONAL tapes still in production the most part of the above listed tapes are dismissed but sometimes you can find them used or NOS on the market. If you are looking for these kind of tapes be very careful: uninformed buyer can buy damaged or unsuitable tapes for music recording. buying tapes for data or instrumentation use as Ampex/Quantegy 467 or 797, 799, and 3M/Scotch 8207. These tapes DON'T WORK FOR AUDIO USE. Pay attention to the "sticky syndrome" tapes as Ampex 456 457 406 407 produced from '75 to '85 and 3M/Scotch 226 227. Some other tapes not defective but poor quality are Sony SLH and AGFA PEM469 (which is nothing at all like very good 468). At least: a basic difference in professional field is the high or low reprinting tape. High reprinting tape: expensive, high quality, low heads consumption but little echo effect on the blank part of tape (the so called "print through" effect). Low reprinting tape: cheap, low quality, high heads consumption but no or very low print through. TAPE CARE AND HANDLING TIPS. Magnetic tape is a strong enough support: you can record it several times and play back one time more, cut and paste with proper splicing tape for editing, but it needs some basic care suggestion. First of all AVOID ABSOLUTELY MAGNETIC FIELDS NEARBY THE TAPE (like these from TV, loudspeaker, dynamic microphone, electric and microwaves oven, electric transformers, etc.). Magnetic fields can partially (or in worst case completely) erase a recorded tape. Avoid dust collected on tape which damages tape and heads too. After use don't leave the tape unused on the recorder, recover it in its box and store in upright position. Tape recorded in one way only (full, half and multi tracks) have to be stored wound on the right reel with the start inside of the reel, avoiding to rewind tape at the end of playing. This has three advantages: reduce the print through effect which, if present, is masked by the original reverberation effects of the program; have a perfectly non mechanical stressed wound tape; they have to rewind the tape before playing this further reduce the print trough effect and "refresh" the tape. As for every media support like vinyl and CD too, avoid to touch the recorded tape with fingers, expose it to direct sun light, in smoking places and to dust. A total erasing with an external bulk eraser is recommended to full erase a blank tape and set it in pristine conditions. Last but not least the recorder has to be maintained cleaned and in perfect functional condition, right aligned both mechanical and electrical. This avoid damage the tape by stretching it, depositing debris on its surface, having poor bound on the reel and poor quality recording. Above: two perfectly wound tapes. Below: on the left tape wound in wrong way - on the right usual distortion due to wrong wound and high temperature storage. Elevated temperature affect the layer to layer print through of the recorded signal, can cause layer to layer adhesion and tape backing deformation. High humidity can cause, in many tapes manufactured from 1970 to 1985, the loss of glue (you will have the so called “sticky” tape) which damages definitively the tape and hardly soils the heads, capstan shaft and tape guides till to stops the tape running and damages the recorder too. The effects on tape guides and heads due to a sticky tape rewound for 30 sec only and played for 5 second only!As you can see the dirty is not the usual "good smooth brown" collected after some month of normal use, but an hard, white /brown mixture of of magnetic fibre and dust very hard to clean. To the contrary a well preserved, average used, 50 years old tape plays as brand new! The real problem about life duration of all media supports, tapes included, is the faster obsolescence of the hardware to play them than the life of the support itself. Do you remember what happened to the vinyl disc when CD arrived on the market? None factory build turntables more but there were millions vinyl discs still around the world to listen to. The same thing happened with the reel to reel recorders production stopped when digital recording went on the market. But there are hundred millions hours of recordings on magnetic tapes, not only music but the entire human history of the last century is recorded on analogue audio and video tapes. Vinyl discs have been discovered again these last years and now many factories are producing again every kind of turntable and vinyl discs. Many tape recorders have been destroyed in the '90es but many still stay around, jealousy conserved by their owners or restored by technicians and audio analogue lovers like me. They will became more and more precious in the future. If you discover your tape is damaged might is not too late to play it again! There are some restoring and rescue methods to play a damaged tape just one time more to copy it or migrate to a digital support. One of the most common problem are the "sticky" tapes. The method to restore “sticky” tapes comes from an Ampex patent of 1989 the so called “baking” tape procedure. This apparently simply method has to be accurately set in practice according to the kind and tape condition to avoid damage the tape definitively (CAUTION: AVOID TO USE WITH ACETATE TAPES). Very interesting news about professional tapes restoration are in Audio tape restoration site by Richard Hess. I'm fully equipped to read every kind of tapes without noise reduction system or with Dolby A, B, C, S, SR, DBX, TELCOM noise reduction units. I can process old no coded tapes with a professional denoiser too. I can transfer analogue tapes into digital or new analogue tapes with professional analogue studio machine or digital A/D up to 24 bit 196Khz using worldwide acclaimed professional HiEnd Benchmark devices. Feel free to contact me if you need tape restoring and/or a backup copy. I have in stock news tapes, NAB adapters and many other accessories for open reel recorders. Please refer to the UPGRADE - ACCESSORIES -SPARE PARTS page.  SOUND QUALITY: see ANALOGUE VS DIGITAL page.